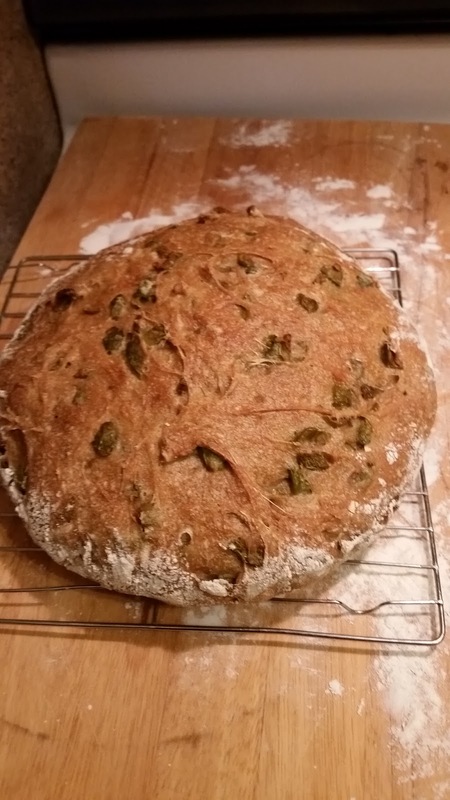 Making your own bread might seem like a waste of time to some, especially with so many amazing bakeries here in the Bay Area, but it's a very satisfying task, saves you money (those six-dollar loaves and four dollar slices of toast can really add up), and it's actually easier than you might think. You don't have to turn up the heat in your apartment to 85 to create natural yeast or anything extreme like that, but if you haven't read about when Jeffrey Steingarten did that in The Man Who Ate Everything, I highly recommend you pick up a copy. Hi.La.Ri.Ous. 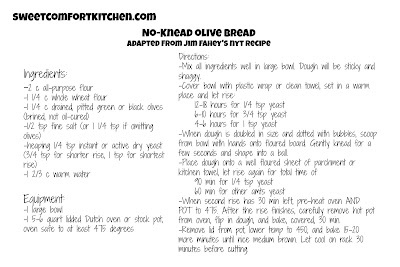 Some years ago my old hometown friend Adam shared a link to the now incredibly famous No-Knead Bread recipe shared by Jim Lahey to Mark Bittman's NYT blog. I tried it and it made such lovely bread that I'll probably never need another base recipe (unless I'm making sandwich bread or focaccia). 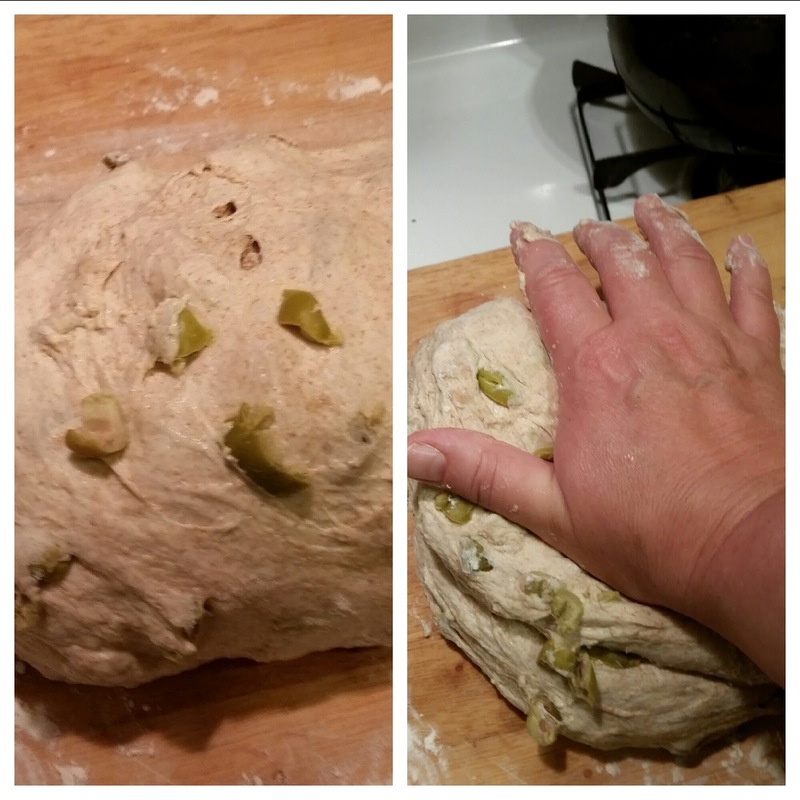 You don't need a mixer or super strong forearms for kneading. The only "specialty" equipment you'll need for optimal results is a 5-6 qt Dutch oven or stock pot with a lid that's oven-proof to 450 or 475 degrees. Why the lid? It traps the steam let off by the bread and makes an amazing crust with a good chewy bread inside. A recipe I tried once suggested using a spray bottle periodically for the same effect, but I'm sticking with the pot. 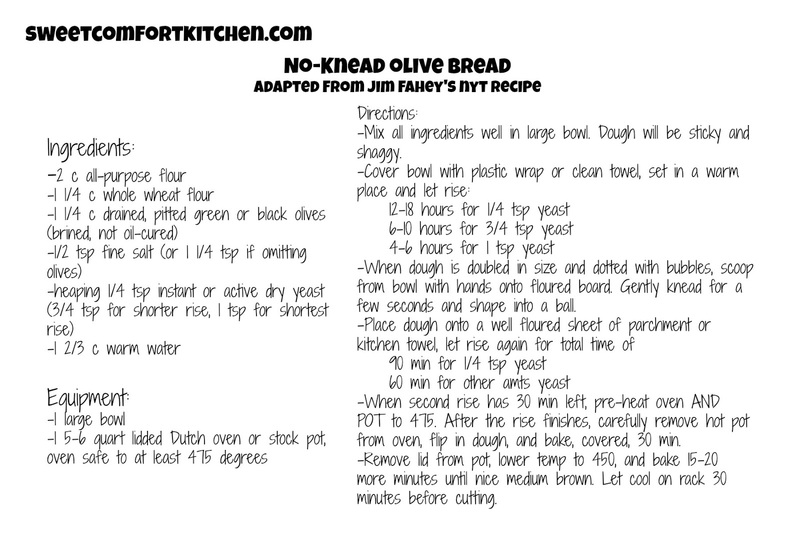 The original recipe takes very little work but a total of 15-22 hours including rising times, so it is weekend bread for those of us with full-time gigs. That timing is what I'm working off of here, but I also add adjustments for weekdays (more yeast allows for a faster rise time). So why olives? Olives are one of my absolute favorite things on earth and one of the few things I like in my bread. 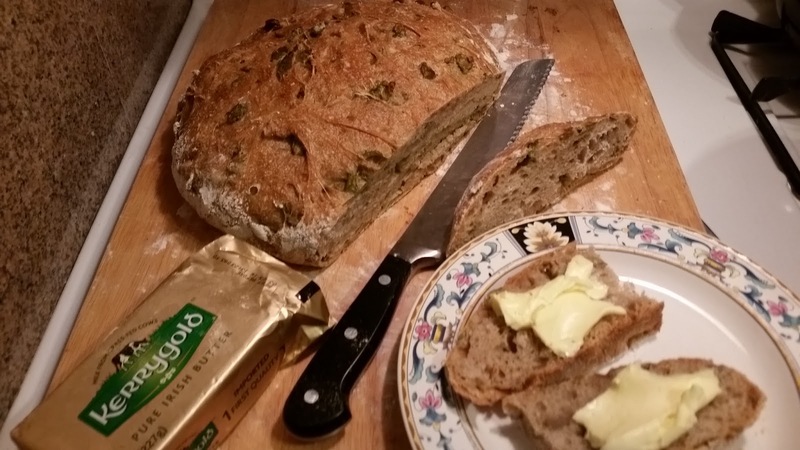 Much as I love raisins and walnuts, I don't really like them in bread. It's a texture thing, I guess. You can certainly leave the olives out and replace them with one of those other things. First, drain and chop 1 to 1.5 cups pitted brined olives. I'm using green, which are milder and thus can be used with a wider variety of sandwich fillings, but they usually need to be pitted if they're not stuffed with something. I got a jar at Trader Joe's instead of hitting the expensive olive bars at the specialty markets. You could use Kalamatas if you preferred, but not the old-school black olives in the can. Those are too mild to stand out in the bread. 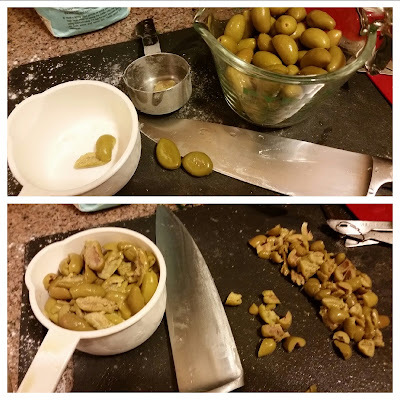 If you need to pit the olives, smash them with the side of a chef's knife. Yes, you could use an olive pitter, but for me the little suckers always go flying when I try that. Pull out the pits and set the "meat" aside. Chop the olives into 4-6 pieces each. If you use walnuts instead, give those a rough chop as well. Add the olives to a large bowl with 3 1/4 c flour, a heaping 1/4 tsp instant or active dry yeast*, 1/2 tsp fine salt (up the salt to 1 1/4 tsp if you're not using olives), and 1 2/3 c warm water. Make sure the yeast you're using has an expiration date very far from the day you're using it or you might not get good results. 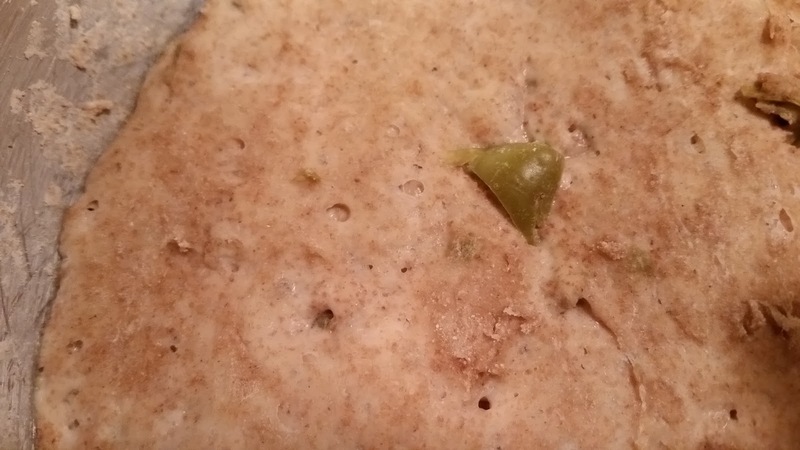 I use 2 c all purpose and 1.25 c whole wheat, but you can use any combination of those you like. All white flour (bread or all-purpose) will give the best crust, hands down. *Faster rise options: use 1 tsp instant yeast for a 6-10 hour rise, 3/4 tsp rapid rise yeast for a 4-6 hour rise. Now just mix it all together with a wooden spoon or a pair of clean hands. The dough should be kind of sticky and a little wet. Cover the bowl with a clean dish towel or a piece of plastic wrap and let sit in a warm spot for 12-18 hours. * "Warm" means 70 degrees or so and my apartment is rarely that warm, especially since the June fog has decided to visit us a month early here in the Bay (#KarlTheFog). I turn on the hood light over the bowl to keep it just a smidge warmer than the rest of my kitchen. *Faster rise options: remember if using more yeast, let sit for the time indicated above. You can mix it together before work and pick up the next step when you get home. After the rising time, the dough will have spread around the bowl and developed these little holes and bubbles at the surface. Usually I see more of the bubbles, but since it has doubled in size and that's the most important thing, I'm not worried. I could let it go another hour, but a girl's gotta keep her yoga schedule. If some of the surface looks a little dried out, don't worry about that either. It'll re-hydrate in the next step. Generously flour a wooden board and turn the dough over a few times, folding an end and pushing down with the heel of your hand. OK, technically this is kneading, but it's just for a few seconds as opposed to ten minutes. 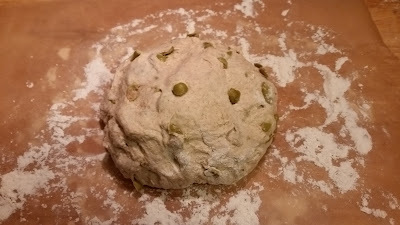 Now flour a large piece of parchment paper and put that under the dough. You could also use a second clean dish towel, but you'll need to use a LOT of flour for that to keep it from sticking. 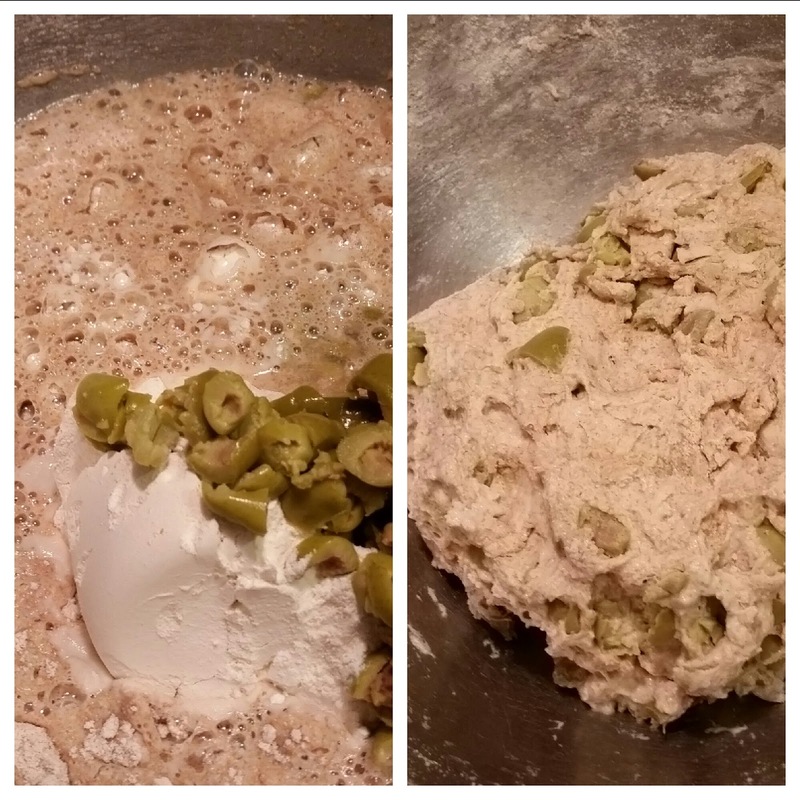 Create a ball with the dough with the smooth side up and rough sides underneath. It's hard to see here because the olives disrupt it, but the dough is having a lovely alchemical moment and creating the basis for the lovely crust. Cover again with the dish towel (or a clean one if you put if on something dirty by accident) and tuck it in for a nice nap. After 60 minutes (30 min for the faster rise options), put the empty pot in the oven and turn the oven on to 475 degrees for a 30 minute pre-heat. 450 is perfectly fine if that's as hot as your pot will handle. 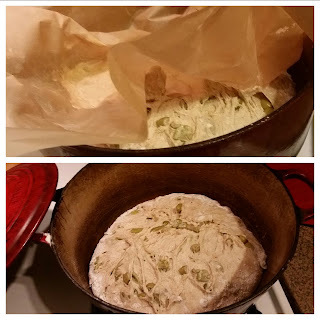 Some recipes say to put the lid on for the pre-heat, but I find that it makes things too complicated when it's time to put the dough in the pot. I leave it off until the dough goes in to avoid burning myself. 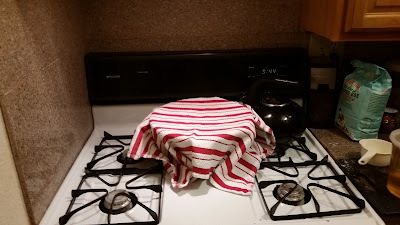 After the 30 minute pre-heat, CAREFULLY remove the pot from the oven with your biggest oven mitts or maybe double pot holders. Not only is the pot extremely hot, but also the weight of the pot will cause the heat to go to your skin more quickly if your finger slips. This is a lesson I learn over and over again, maybe so I'll remember to share it with you. Pick up the parchment or towel and flip the dough into the pot. I didn't put enough flour, so it stuck to the paper a little. If that happens, just peel it off carefully, a little at a time. If you put too much flour, it sprinkles all over the place and stains your pot. Any tips for cleaning burnt on stuff from enamel would be appreciated! Put the lid on the pot and return it to the oven. Bake for 30 min, remove the lid, turn down the heat to 450 and continue baking for 15-20 minutes more until the crust is a lovely medium brown. Carefully remove the loaf to a wire rack and let cool at least 30 minutes...if you can manage to wait that long. Bread smells awfully good when it's baking! Slice with a bread knife and eat as is, with some good butter (the kind from grass-fed cows) or use to make hearty sandwiches. Egg salad or sliced turkey would be particularly good with this bread. right click recipe image to save, then print from your computer.